Body painted Air New Zealand staff support new commercial. That’s an alligator by the L/H Main Gear, Folks! (2) The20woman makes the salad, prepares the vegetables, and makes dessert. 8. Nobama met with small businesses - GE, Pfizer, Chrysler, Citigroup and GM, to discuss the Stimulus Package. 4. People in Africa are donating money to Americans. Mothers in Ethiopia are telling their kids, "finish your plate; do you know how many kids are starving in America ?" And my most favorite indicator of all. As I was working on Bailout Nation, I struggled to find a way to communicate the myriad forces that combined to cause the collapse. The book details the many elements involved, but I wanted a visual way to depict what I took 20 chapters to explain. I had long been a fan of Wall Stats — the great site that Jess Bachman runs. Over the course of a few days, I described the various factors and how they interact. Jess took what I described, and turned it into a terrific graphic that goes a long way to explain what happened (credit the bomb to Mrs Big Picture). 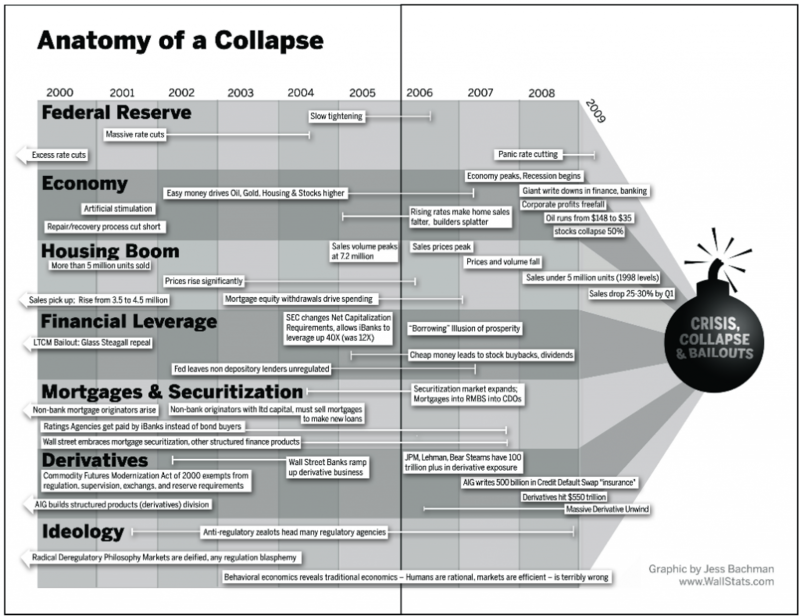 It became the centerfold of the book, running just before Part IV (Bailout Nation). I don’t think any other graphic has so cleanly depicted the factors that led to the crisis developed . . .